This broadcast of CoastLine originally aired on April 8, 2015. Keeping beautiful beaches beautiful, protecting homes and public infrastructure from an encroaching ocean -- these are the challenges that have faced beach communities since people started building on them. One important tool for managing a shoreline is beach renourishment – pumping sand onto a beach that is eroding. For years, the federal government has picked up the lion’s share of the cost for many of these multi-million dollar projects. But as the specter of losing all federal funding looms, coastal communities are working hard to find new funding options. On the Washington front, U.S. Representative David Rouzer, of North Carolina’s 7th district, recently worked with seven other politicians to reanimate the Congressional Coastal Communities Caucus – which, they hope, will highlight the needs of coastal areas whose beaches are critical to the economic health of their states. Environmental advocates say that beach renourishment raises important questions partly because it impacts the ecological system more profoundly than many people acknowledge or understand. And, they argue, turning back the clock by pumping sand onto the shore will become less effective over time as seas rise and storms become more frequent and intense. Correction: During the show, Layton Bedsole reports that property interests on Wrightsville, Carolina and Kure Beaches were found in 77 of the state's 100 counties. He later clarified that number, reporting that the actual number of counties showing New Hanover County beach property stakeholders, from a 2012 data base search, is 73 of the 100 counties. 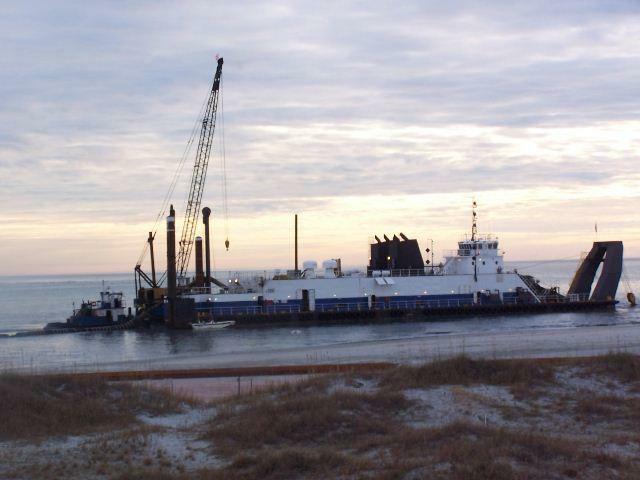 Finding good quality sand that is also compatible with the existing sand on a beach is an ongoing challenge for beach renourishment projects in North Carolina.